Another reminder about Mollies. They do well with salt added to their water. It would be best to make their tank a brackish water tank, maybe one-fourth as salty as a marine aquarium but that can cause other difficulties. Plants don’t do as well in brackish water and you are also very limited to other fish that like brackish water. To make it simple I keep my Mollies, both Silver and Black, in a tank full of Hornwort and Java Moss (and Duckweed and Water Lettuce on the surface). I add a LITTLE salt. Umm…maybe a tablespoon per ten gallons. Over time the tank will get less salty because of water changes. I occasionally add more salt. A little salt and the plants are fine, the Mollies are incredibly active and disease-free. They live with some Endlers Livebearers (OK, Guppies!). Other good tankmates are the Platies and Swordtails. Don’t use table salt. Use salt made for marine aquariums or the salt labeled Aquarium Salt. Don’t keep your mollies in soft water, they prefer hard water with a relatively high pH, like the African Cichlids. My female Balloon Molly died today. She was born in my Saltwater tank. I set up the tank 4 years ago and put in a pair of Mollies to “cycle” the tank. The female had a few babies. I gave away most of them but this one has always been in one tank or another. 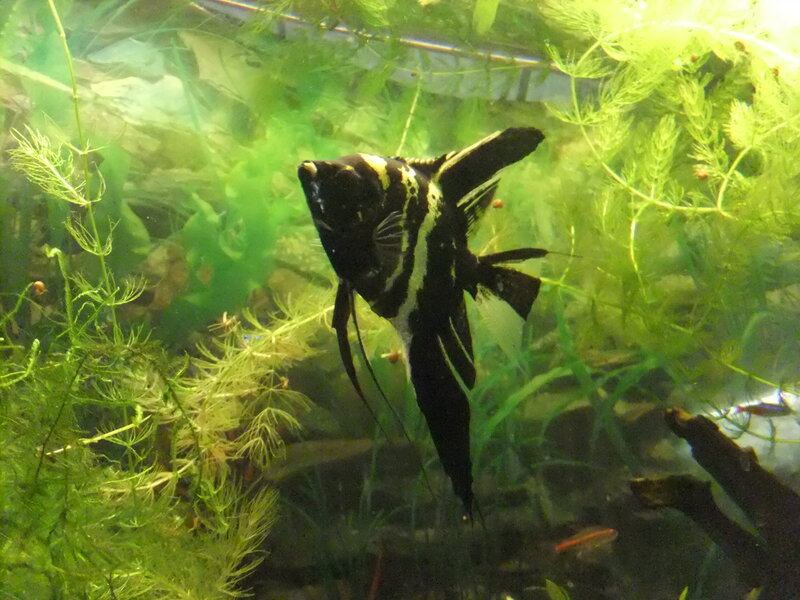 Most recently she has lived in a brackish tank with a Puffer and some Endler’s Livebearers. She didn’t show any signs of old age, she was looking good even yesterday. Today, she is dead. I like the Balloon Mollies. I think they have an awkward cuteness. As I understand it, Balloon Mollies were first seen many years ago by Floridian fish breeders who thought their fat little Mollies were sick, so they culled them. Finally, someone let one grow up and breed and now we have these cute little buggers. Mollies do so much better in brackish water. By brackish, I mean a saltwater solution. Let’s say about one-fourth as salty as a Saltwater aquarium. Mollies are so susceptible to fungus and “shimmies”. Instead of medication they need salt! 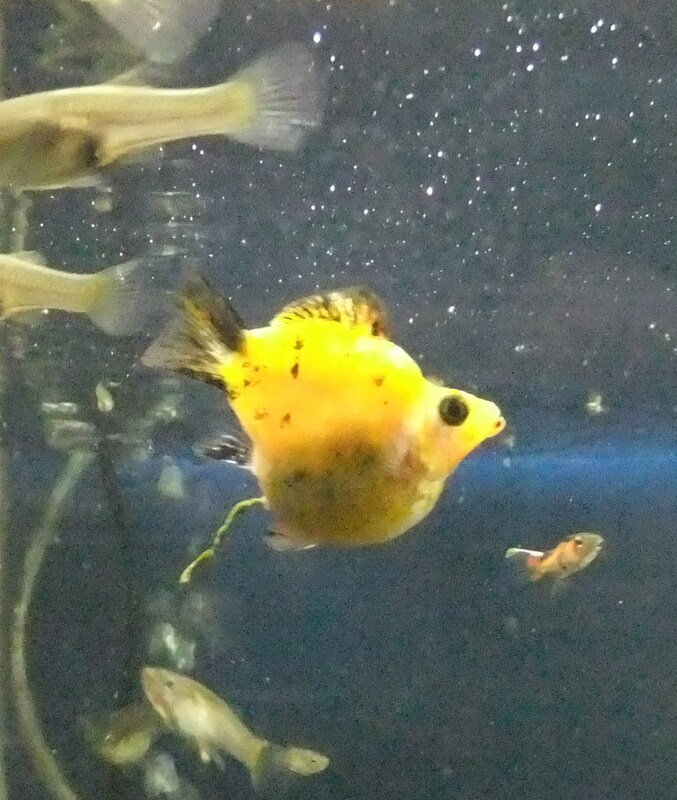 Platies are a mainstay of the tropical fish hobby. There are so many colors to choose from. Usually at the fish store they have the different variations in separate tanks. Last year I saw a tank full of nothing but Platies of all different colors and it was awesome! White sand, green plants and Red Wag Platies. A real eye-catcher created by my nephew. If you are looking at Platies and Swordtails and Mollies and can’t decide which one to get for your tank, take this into consideration. 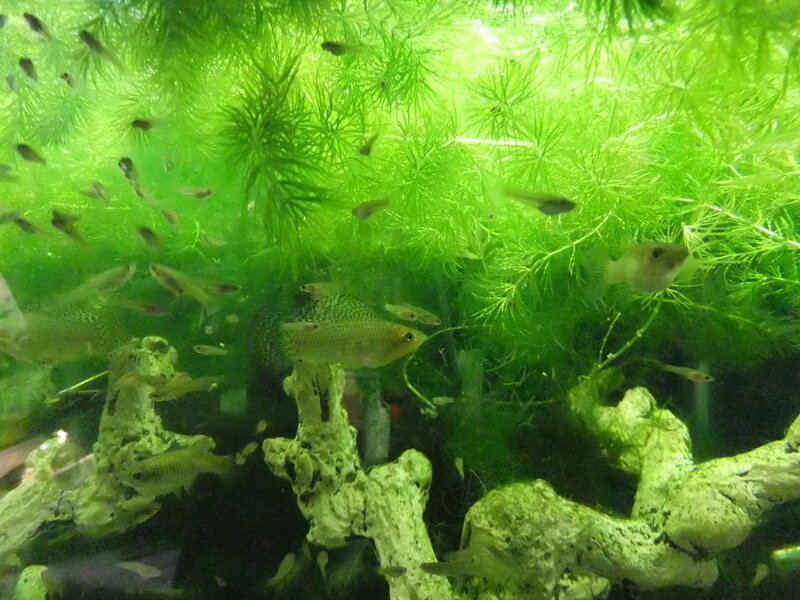 The Mollies will be disease prone if you have a completely freshwater tank, they prefer brackish water. The Swordtails can be a little feisty sometimes and are definitely jumpers. 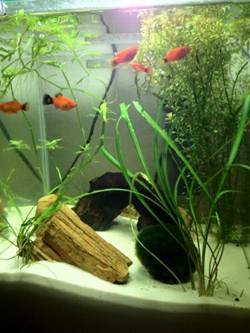 Every aquarist who owns Swordtails will find a dried-up Swordtail laying on the carpet someday. The Platies are peaceful, active and breed readily. If you have some places for the babies to hide some may survive. If you decide to get Platies, the recommendation is always to get 2 or 3 females for every male. One male will chase a single female all day. The person at the Petstore should know how to tell the difference. If not, good grief what is the world coming to.